February 5th and 6th ONLY, receive a $100 Buffalo Wild Wings gift card with every vehicle purchase. While supplies last. 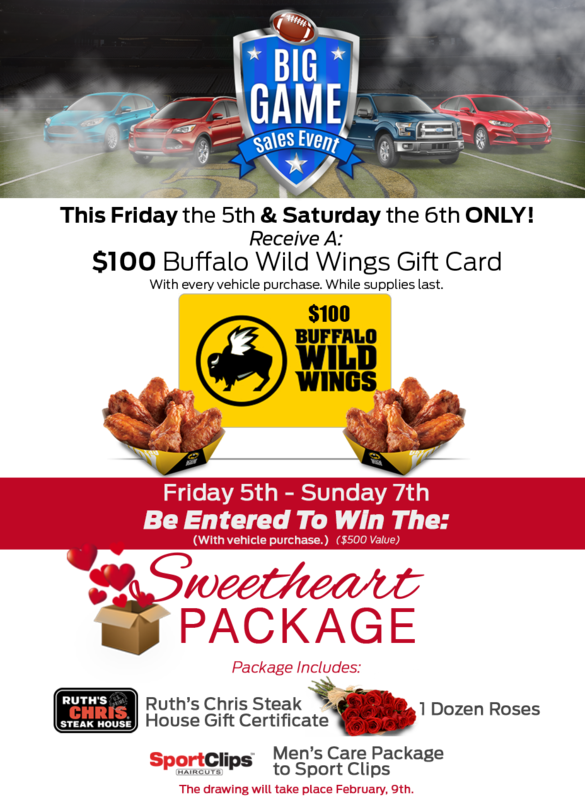 Also, February 5th, 6th and 7th, be entered to win (with every vehicle purchase) the Sweetheart Package valued at $500! You’ll receive a Ruth’s Chris Steak House Gift Certificate, 1 Dozen Roses, and a Men’s Care Package to Sport Clips. This weekend only during the Big Game Sales Event! Don’t miss it! Stop by Waldorf Ford today or shop online at www.waldorfford.com! This entry was posted in Uncategorized, Waldorf ford and tagged Big Game Sales Event, ford dealer, Ford Dealer Maryland, Ford Dealership, Super Bowl 50, waldorf ford, Waldorf Ford Dealer, waldorf maryland by Administrator. Bookmark the permalink.